Electric car charging at Sainsbury's | What Car? Supermarket giant Sainsbury's has launched London's first network of electric car charge points. Charge points are free to use for Sainsbury's customers, and will be available at 11 stores across the city, so drivers should never be more than a few miles away from being able to top up their battery. Neil Sachdev, Sainsbury's commercial director, said: 'This will turn London into an electric vehicle superhighway, giving drivers greater freedom. Where can I charge my car while I shop? Additional charging points will be opening at stores in Wandsworth and Whitechapel later this month. Mayor of London Boris Johnson welcomed the announcement, which will help him achieve his goal of turning London into the 'electric vehicle capital of Europe'. 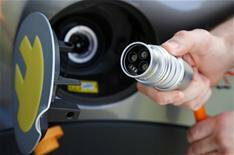 The Mayor wants 25,000 charging spaces publicly available in London by 2015, and 100,000 of the city's cars to be electric as soon as possible.